When it comes to food storage and take away, you might have heard that if you store hot food and drinks in plastic the chemicals in the plastic could leach more easy into your food/drink. Plastic producers will say: everything is safe when it is BPA free! People concerned about health and plastic will definitely tell you there are more potentially harmful chemicals in plastic than just BPA and chemicals will leach more easily when in contact with heat. Choose for yourself. I myself still use my foldable silicone container to pack food when traveling and hiking. But I do try not to fill it with hot food. I would use old plastic container to store dry food like beans, lentils, rice, or also non food stuff etc. To avoid throwing them away. Trying to live low waste and striving a plastic reduced life certainly can make you want all the fancy zero waste stuff. But first this would become very expensive, and secondly it is not necessary. You could reuse glass jars from pickles or sauces! Or try and look for second hand ceramic or stainless steel container and just use what you have before throwing it all out. At the end it is all about sending less to landfill. So just disposing all the plastic that is in your life already would not make sense. Glass jars are also easily found in thrift stores or online if you like glass more. Perfect for coffee to go too! Why switch to stainless steel? Stainless Steel Food Grade 304 is a healthy and safe alternative for plastic. It is perfect for take away or food storage. You can fill it with hot food and no chemicals will leach into your food. It will just get a little hot, so put a cloth around it. Yes, they might be a little expensive to purchase, but they will last forever… Not like the plastic container that will break after a little while and then end up on landfill. You can also purchase them second hand on online second hand platforms or thrift stores. 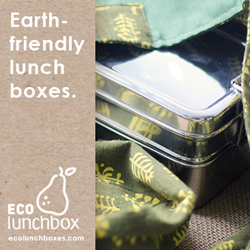 You’ll find different sizes of stainless steel container at the Eco Lunchbox store. 3 tier lunch box system from India. 3 in one Stainless Steel Bento Lunch Box. Holding up to 6 cups of food.